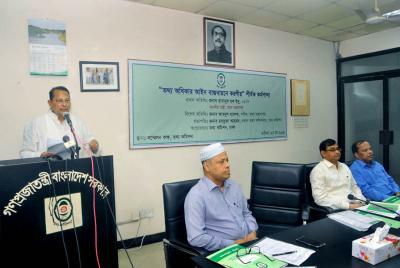 DHAKA, May 27, 2018(BSS) - Information Minister Hasanul Haq Inu called upon the BNP to refrain from defending and glorifying "drug-peddlers". "It merely serves the purpose of the drug syndicate and its beneficiaries," he said. Refuting charges of extra-judicial killings, he said, "There were no extra judicial killings in the country during the regime of Prime Minister Sheikh Hasina." "Even the war criminals and Bangabandhu's killers had enjoyed due protection of law." He reminded them that extra-judicial killing was the hall-mark of the BNP, who had not only carried out such activities during their tenure but actually passed laws indemnifying them. The minister was addressing a meeting at the Information Commission. Referring to the passage of the "Right to Information" Act, 2009, the minister said that it was meant to ensure transparency in all government activities. "It is through this law that people exercise their power over the administration," he said. The meeting was also addressed by Chief Information Commissioner Mortuza Ahmed and Information Secretary Abdul Malek.